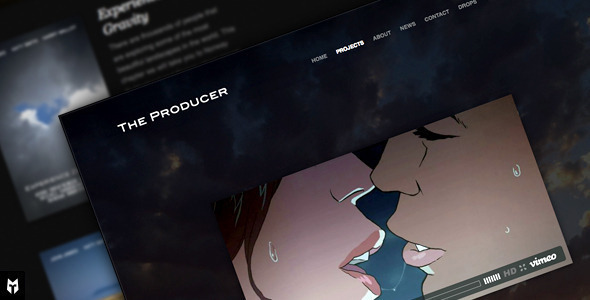 The Producer is a film-focused WordPress theme for studios and production companies. It was entirely designed around showcasing videos. Features a unique “panel” effect when scrolling as well as a traditional credit roll effect. This is an outstanding theme! Having a fun time playing around with it. Great theme… No absentee landlord here, you get help from the designer. Well done. Chris what a theme! No one brings more creative stuff to the table than you do at TF! Super easy built-in admin panel. * Improved related tab performance when empty. * Fixed issue search option not displaying on Customize page. * Fixed issue with displaying video on home page. * Added: ZoomBox lightbox plugin zip file to files folder (optional). * Removed: prettyPhoto lightbox plugin due to vulnerability. * Fixed title display issue on category pages. * Adjusted version number to avoid conflict with similar-named theme. * Added support for WP 4.1 features/requirements. * Fixed social icon loading issue. * Addresses a script loading issue. * Fixed minor excerpt issue in the home page slider. * Fixed credit roll speed issue. * Added video option for home page header area instead of text. * Added search bar on/off option for header area. * Added background transparency control. * Added WP Theme Customizer support - replaces OptionTree theme options. Very easy to use. Looks super professional and has the features to make your film look great.